Successfully Added Rugged Android 6.0 Smartphone - IP68, Quad-Core CPU, Walkie-Talkie Feature, Google Play, 5MP Cam (Yellow) to your Shopping Cart. This remarkable rugged smartphone is the perfect device for all outdoor enthusiasts that like to bring along their Android phone on their adventures without having to worry about bumps and scratches. 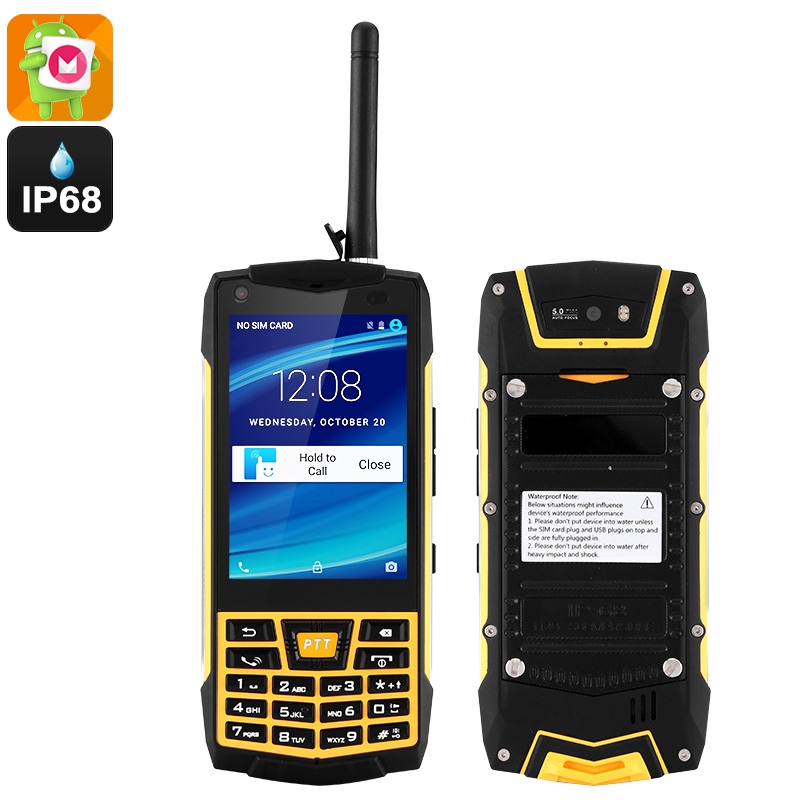 Rated IP68 waterproof this Chinese smartphone has been designed to withstand the most demanding of environments, allowing you to head into the wild and carry along your mobile phone with confidence. With its traditional design, this fully rugged phone features a keyboard along with a 3.5 inch display. Although it features a keypad it does hold a touch screen allowing you to use it as if you were holding a regular smartphone. Its Android 6.0 operating system lets you enjoy a smooth and lag free user experience and offers all the latest industry features. With Google Play installed on each device you are free to download millions of the latest Apps and games that can now be enjoyed on your Android device – providing you with years worth of mobile entertainment that won’t cost you a dime. Equipped with a Quad-Core CPU that has been clocked at 1.2GHz and 1GB of RAM this Chinese smartphone holds some decent hardware that allows you to smoothly run the latest applications and mobile games. Featuring an internal memory of 8GB that additionally can be upgraded by another 32GB of external storage, this Android phone offers you plenty of space to store all your favorite media and files that now can be easily carried along in your pocket no matter where you’re headed. Besides working as a regular phone this rugged phone can also be used as a Walkie-Talkie allowing you to stay connected to people in the nearby area in an energy- and cost-efficient manner. Additionally, it features a large 2700mAh battery that provides plenty hours of continuous usage time, taking away the fear of ever running out of juice while out in the wild. The perfect device for all outdoor enthusiasts, this fully rugged Android phone will follow you everywhere you go and with its rear 5MP camera it allows you to snap stunning pictures that can be shared with friends and loved ones once you returned from your upcoming outdoor adventures. This rugged Android Phone comes with a 12 months warranty, brought to you by the leader in Android smartphones as well as wholesale electronic gadgets..